Existing Home Sales are at their highest levels in over 2 years, according to an October report published by the National Association of REALTORS (NAR). Fueled by increased activity among first time home buyers, the existing housing market has shown gains in five of the last six months. Based on the recent 9.4 percent increase from August to September, NAR is predicting annual sales volume of 5.57 million units for 2009, up from the earlier prediction of 5.10 million units. Buyers are taking advantage of low interest rates and a first time buyers tax credit available through the end of November. 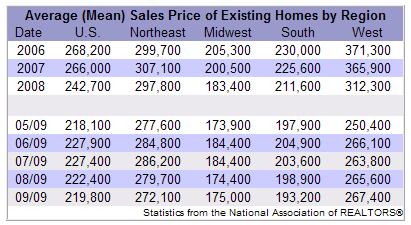 "Much of the momentum is from people responding to the first-time buyer tax credit, which is freeing many sellers to make a trade and buy another home," said Lawrence Yun, NAR chief economist. "We are hopeful the tax credit will be extended and possibly expanded to more buyers, at least through the middle of next year, because the rising sales momentum needs to continue for a few additional quarters until we reach a point of a self-sustaining recovery." Total housing inventory is trending down across the country, reaching its lowest level in two and a half years. Inventory fell to 3.6 million homes available for sale at the end of September. This represents a 7.8 month supply at our current sales pace. "If we could continue to absorb inventory at this pace, home prices would return to normal, modest appreciation patterns next year," Yun said.